Imminent collapse of Society – Gods response! This is an article that I have recently been sent from Christian International Europe and which I have reproduced to share with you for encouragement and prayer. 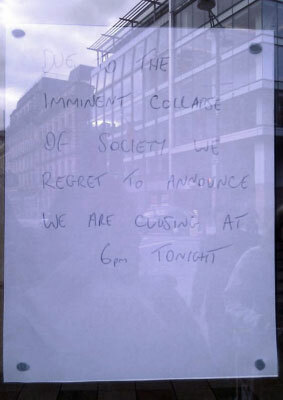 window during England’s riots and looting. Here we have “natural prophetic voices” and “spiritual prophetic voices” blending throughout this disorder declaring a broken society were an entitlement mentality based upon excessive benefits has led to criminality. This is not about Human Rights, but excessive benefits conditioning. What is occurring in the natural is contrary to what I am doing in the Spirit. I am raising a revolution through young radicals, not looters without a cause. • Build a spiritual momentum that will forcefully spread through nations. This is a release of worshiping warriors who will build and advance My kingdom. As others around the world observe that I am moving in England, they will rejoice in hope. For people will respond better to hope than fear. And the anarchy in the streets of England will give way to Amazing Grace demonstrated in power and love through young radicals. Rom 5:20, “But where sin increased, grace increased all the more.”Intercessors this is today’s Battle for Britain!